This article was published by ComputorEdge , issue #2644, 2008-10-31 , as the cover article, in both their PDF edition (on pages 6-11) and their website. Everyone is born creative. Any healthy infant — regardless of gender, race, or culture — can be given a set of crayons and a stack of blank paper, and will know exactly what to do with it. For some fortunate souls, this creativity somehow manages to survive our bureaucratic educational systems and later the workaday drudgery of adult life in the modern world, to be expressed in art, dance, music, sculpture, and many other artistic forms — whether on a professional or amateur basis. For those of us who, for whatever reason, are not able to spend the bulk of our time pursuing artistic endeavors, even for a paycheck, it becomes difficult to juggle the never-ending demands upon our time and energy, and reserve enough of that to unleash the creativity that may have lain smoldering inside us since our first encounter with crayons and paper. Yet despite the monotony of much of the work done on personal computers — and their contribution to the stress of modern lifestyles and careers — they can also provide a doorway to artistic expression within a limited budget of time and money. Countless adults worldwide are discovering that computer-based drawing and painting can be one of the most accessible ways to nurture their right-brain thinking, and to rediscover some of the pure fun that most of them had resignedly considered lost forever. These computer art applications come in a wide variety of capabilities, ease of use, and monetary cost. In this article, I will examine a range of such programs, beginning with the more advanced options. At the highest end of the spectrum for digital graphics programs, one finds fully featured suites such as Adobe Photoshop CS4, which for most readers would be complete overkill — too many menu items, too much user interface complexity, and too high a price tag ($699 for the standard edition, and $999 for the Extended edition). Photoshop's main rival for the longest time, Fireworks, joined the Adobe product lineup when the firm acquired Macromedia, which originally created and distributed Fireworks. It is now more geared toward graphics for websites, and thus would be of even less value to an aspiring computer artist. The programs that we seek may be able to do the digital image manipulation of the Photoshop realm, but they are designed more for drawing, coloring, painting, and creating original art work. Many of them allow the user to mimic traditional media such as acrylics, colored pencils, oils, watercolors, etc. An outstanding program in this category is Corel Painter X, which allows digital illustration and painting, utilizing a variety of materials, colors, textures, brushes, and brush strokes. It can be considered a complete digital art studio, and thus would be a solid choice for any professional digital designer or artist. Its built-in painting features are so advanced that it can virtually match the behavior and appearance of real brushes, and is even designed to replicate the interaction and sensation between the brush, its paint, and the canvas. As a raster-based digital art program, it supports the painting of digital photos, and is even capable of adhering to the lines and contours of the original paint strokes captured in the digital image. Practicing the brush strokes of a Picasso could certainly be an effective method for improving one's skills. The palette tool offers several color schemes associated with particular artistic styles, including Classical, Impressionist, Modern, Watercolor, Sketchbook, and Chalk Drawing. It also supports functionality typically seen in image manipulation programs, including pattern pens, cloners, photo enhancement, animation, Web graphics, text insertion, and various special effects. Corel Painter X runs on Microsoft Windows and Mac OS X, and sports a list price of $429. At that level of cost, it would be wise to first start with a less expensive alternative, simply to confirm that you truly will continue pursuing computer art, thus making the investment worthwhile. The package does include a user guide exceeding 300 pages, as well as downloadable video tutorials. You are most likely going to need these resources, because Painter X, like Photoshop CS4, has a significantly steep learning curve. For graphics and art professionals, the sophistication of the aforementioned applications may be necessary, and worth the expense. 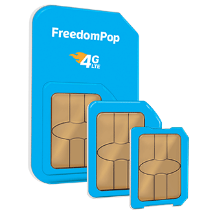 But for we mortals, there are numerous alternatives that are more affordable, easier to use, and more appropriate for creating simple artwork. Further down the price curve, and yet more approachable for amateurs, is another entry in the Corel family of software: Painter Essentials 4, which is considered a very capable application for painting, drawing, sketching, and turning photos into paintings. Painter Essentials has much of the functionality of Corel Painter X, yet is available at less than one quarter the cost, $99.99 (not to be confused with $100). The program offers a full selection of brushes, paints, pens, and paper textures. As with its more advanced family member, Painter Essentials includes Smart Stroke Technology, RealBristle Brushes, and Brush Drawer. That last feature makes it easier to navigate and choose the best brush for the task. Color selection can be done with a single mouse click, and is facilitated by a new mixer palette, which simulates the mixing of colors on a traditional paint palette. This is in addition to the regular color wheel. Artists who like the idea of the computer doing as much work as possible, should be intrigued by the auto-painting feature, which allows you to create photo art with a minimum of effort. Similar to Painter X, this version comes with full documentation and training videos, to help you in learning how to make the most of the program. On the downside, it does not allow you to create or import custom brushes, nor can you preview fonts prior to usage. Free 60-day trials are available for both Corel products. If you — or at least the budding artist within you — flinch at the sight of the seemingly numberless toolbar icons that clutter most drawing applications, then you may be quite pleased with the minimalist and innovative interface of Autodesk SketchBook Pro. Originally developed by Alias, SketchBook Pro is a well-regarded freehand painting and drawing application designed specifically for users who prefer working with a stylus, such as those using a graphics tablet or a Tablet PC. The program allows you to work with virtual pens, pencils, airbrushes, paintbrushes, markers, smearing tools, and erasers. You can create custom brushes by changing the size, spacing, roundness, slant, and transparency of the brush strokes. However, it does not support basic shapes, textured surfaces, thick paint, filtering, or digital effects. 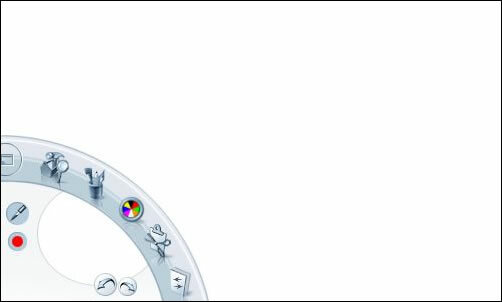 It truly is geared to freehand artists, and this is also reflected in the low learning curve, the clean user interface, and the unique "one-flick" menu system that allows the artist to specify different tools and menu options with just the flick of a stylus, minimizing the need to put down the pen and use the keyboard. The cost for SketchBook Pro is a reasonable $100 (kudos for their truth in pricing, unlike Corel's 99.99 nonsense). Prior to buying, you can download a 15-day full-feature trial version, and try it out. It supports the more recent versions of Windows and Macintosh (one more reason to dump Windows NT, 9x, or ME). Even the majority of the affordable and straightforward programs discussed above may still be overwhelming for creating some simple artwork for holiday cards, office break room flyers, and other quick jobs. In these cases, it may be sufficient to choose a program such as ArtRage. Made available by Ambient Design, ArtRage boasts an attractive user interface, with a full range of painting and drawing tools. Both editions, Full and Starter, run on Windows Vista, XP, and 2000, as well as Macintosh OS X.
ArtRage 2.5 Full Edition, which only costs $25, offers a variety of painting capabilities, including multiple layering, metallic paint, stencils, and rulers. The Starter Edition, which is completely free of charge, provides you with over half a dozen painting tools, and allows you to create, print, and save as many images as you want, without limitation to their sizes (unlike some other lite versions of computer art programs). Both versions support crayons, pens, pencils, paintbrushes, and even glitter (making it ideal for elementary school teachers continually challenged to develop artwork for their young charges). You can import digital images, to be used as a starting canvas, upon which you can paint. As seen in the figure above, Ambient Design has chosen the same approach as that utilized in SketchBook Pro, with the bulk of the application's window area devoted to the canvas, and the tools pushed to the corners and sides, out of the way. This is a noticeable improvement over the Photoshops of the world, which have far too much of the window area consumed by toolbars and ribbons filled with buttons, drop-down list boxes, and other controls — few of which are typically needed at that moment, and some of which are incomprehensible in their meaning (worsened if there is a lack of floating tooltip help information). 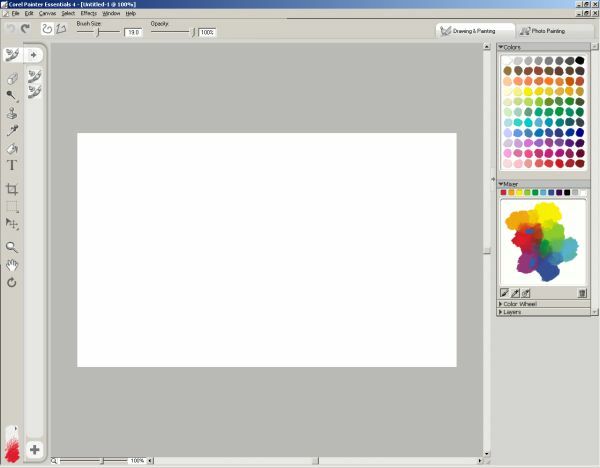 Last and probably least, if your computer art needs are absolutely minimal, then they may be met by Windows Paint, the simple paint applet built into Microsoft's flagship operating system. 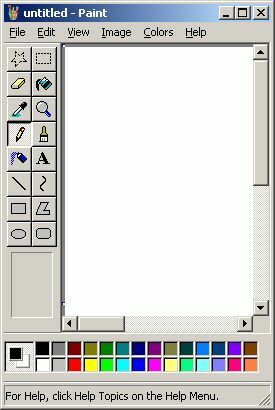 The program may have a sparse interface, but it does make it possible to draw lines, curves, rectangles, polygons, ellipses, and rounded rectangles. These can be filled with colors. You can also use pencil and brush tools, as well as airbrush and text tools. You can even flip, rotate, stretch, and skew images. If your drawing and painting skills are as limited as mine, even Paint might be sufficient for your needs. 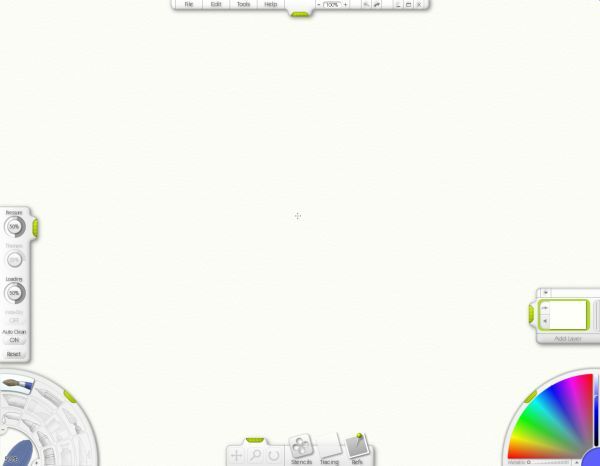 Regardless of how much time and money you have to spend on acquiring and learning a computer art application, there is certainly at least one available on the Web that can inspire you to rediscover the joys of throwing colors around and impressing those boring grown-ups. You were the very first link in Google for "Website Developer". That's pretty amazing. Good job!